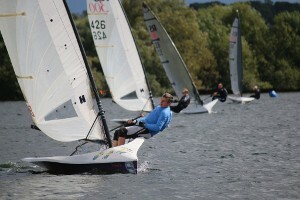 Magic Marine RS300 Grand Prix Series at Attenborough Sailing Club. Travelling from as far as Bristol and Prestwick to an ex gravel pit in the heart of the Midland’s premier nature reserve, 12 RS300s competed at Attenborough Sailing Club on Saturday 12 September 2015 as part of the Magic Marine RS300 Grand Prix Series. In gusting F4, South-Westerly winds the countdown for Race 1 was heralded by an ominous clap of thunder from a passing storm cloud, however, the only lightning came from the over enthusiastic RS300 squad bolting the start only to be met with the double sound signal of a general recall from Race Officer Keith Brereton. A tense restart saw the pack on their way attacking the beat to its South-Western extreme before bearing off between the islands to the first gybe mark before returning to the western extreme of the pond. Running back east, the helms had a choice of which side to take a group of three islands before emerging in full view of the nature reserve’s Visitor Centre, providing a dozen spectacular gybes for the onlookers who are more use to observing the antics of a handful of ducks and barking Canadian geese than a dozen rearing RS300s being launched around a racing mark. At the end of the first lap Tim Keen lead the way back up the beat followed by Pete Ellis, Luke Pepper and Steve Bolland. Laps 3 and 4 saw Luke take the lead which Tim reclaimed and held through the fifth and final lap. After lunch and a small course adjustment to improve the reach, Race 2 started cleanly in bright sunshine but gusting winds. Steve Bolland took the lead on the first lap and held it to the finish whilst Pete, Luke, Steve Sallis and Tim could only exchange positions behind Steve Bolland’s dominant lead before finishing in that order. After a short break on the water, Race 3 saw Steve Sallis lead the first three laps before dropping back to finish in third place behind first place Pete Ellis and second place Tim Keen. After discards, Pete and Tim finished the close fought event on equal points with Pete winning the event based on the result of the last race. Attenborough’s Jon Adams finished overall 9th with a creditable best finish of 7th place in this his first RS300 event.